SMDS students had the great opportunity to decorate our own rain barrels to collect rainwater on the side of the building. This water will be used to water the native plants in our outdoor classroom and garden area. ﻿SMDS operates an indoor vermicomposter and two outdoor composters. 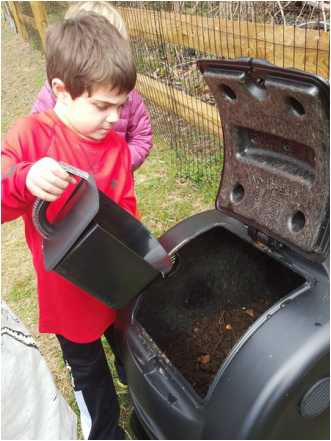 The students regularly add raw materials to our outdoor composters. We use the resulting compost in our native plantings and garden. Additionally, students and staff actively participate in recycling and have made crafts and musical instruments with recycled materials. SMDS also uses electric air hand dryers in restrooms to cut down on solid waste. We have begun using reusable water bottles in our classrooms to cut down on plastic cup waste, and have started a recycling plastic bag campaign. Part of SMDS's outdoor classroom expansion includes the planned planting of native plant species that help to form part of the natural habitat for local wildlife. 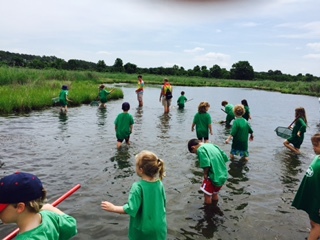 Once each year, students take a field trip to the Chesapeake Bay, learning how to protect our environment and working with Bob Baltz of DNR to plant native bay grasses. SMDS has recently expanded our outdoor classroom for an immersive learning experience. This is a place for the students to learn and plan on a daily basis, weather permitting. In an effort to keep their outdoor classroom and school grounds clean, the students organized their own clean up day which took place in June. We are fortunate to have many environmentally-minded staff, parishioners, and students at St. Margaret's Church and St. Margaret's Day School. As a result, we have access to beautiful outdoor spaces that encourage vigorous exercise as well as valuable learning opportunities. We also promote activities and events that encourage environmentally responsible lifestyle choices, such as our annual St. Jude's Bike/Trike-a-Thon.